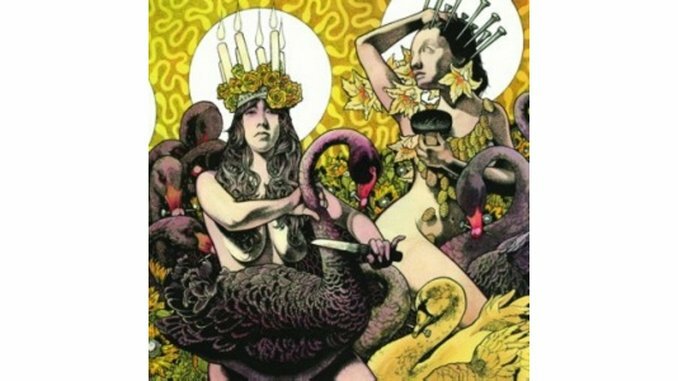 The members of Baroness have always mixed in a little indie rock with their occasionally sludgy brand of prog metal. And they’ve always peppered their albums with pretty little classical- and folk-anchored tunes like “Cockroach en Fleur,” “Bullhead’s Psalm” and “Blackpowder Orchard.” But they’ve never pulled off either with the focus and sense of purpose they do on their latest. Nor have they ever sounded so eclectic, polished or mindful. In some ways, Yellow & Green could be seen as Baroness’ Black Album. While it won’t likely end up the crossover mega-hit Metallica churned out in 1991, the record finds Baroness following in the footsteps of its forebears in that the band is concentrating on proper singing and songwriting more than ever before. “We knew change was coming,” explains frontman John Baizley in the promo video for Yellow & Green. “We felt the restrictions around us cinching in. The space we were occupying was about to burst open, and when it did, what happened [was] this record.” Sonic breakthroughs abound on the album, as the band explores the less-exposed sides of its musical personality, from emo-tinged power metal and driving, angular dance punk to trippy space jaunts and Weezer-esque hook rock. Wall-of-sound trio “Twinkler,” “Cocainium” and “Back Where I Belong” even sound like they’re from some parallel-dimension Pet Sounds that features a pentagram scrawled in blood across the classic petting-zoo cover art. Yellow & Green casts off the shackles of expectation while simultaneously taking a measured step in the direction of accessibility. But even with the slightly poppier feel and all the new sounds creeping in, there remains a welcome aggression to Baroness’ sound. Their mathy riffs and signature dual lead guitars still weave their way throughout; veins pumping with the same vital ichor that’s kept the band alive for nearly a decade. But there’s more depth this time—an orchestrated thoughtfulness that didn’t come through as intensely on the band’s more impassioned, if less realized, Red and Blue albums.